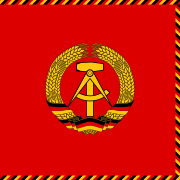 The State Council (German: Staatsrat) was the collective head of state that governed East Germany (German Democratic Republic) from 1960 to 1990. When the German Democratic Republic was founded in 1949, its constitution in its formal structure resembled a bourgeois, federalist democratic system in order to portray the GDR as the legitimate continuation of the prewar Weimar Republic in opposition to the separatist Federal Republic. One of the "bourgeois" features of the constitution (in Article 66) was the office of President, which was filled by Wilhelm Pieck, formerly the leader of the eastern branch of the Communist Party of Germany and now one of the two chairmen of the Socialist Unity Party. However, from the start the East German government was completely controlled by the SED, and over time its actual power structure grew closer to the model of the Soviet Union. When Wilhelm Pieck died on 7 September 1960, the head of state was reshaped along those lines. The constitution was amended on 12 September 1960 by the Law concerning the formation of the State Council, which created a collective body in place of the presidency. The same constitutional amendment also acknowledged the role of the recently formed National Defense Council (Nationaler Verteidigungsrat) in GDR defense policy. The State Council remained virtually unchanged in the 1968 constitution and amendments of 1974. The State Council was elected by the People's Chamber, the East German parliament. Its term was originally four years, but was later changed to five years. The body consisted of a chairman, several deputy chairmen (usually six), further members (usually sixteen) and a secretary. Members were taken from the political parties and mass organizations affiliated to the SED-controlled National Front. Occasionally an otherwise prominent citizen was also included. Outside of East Germany, the chairman's post was reckoned as being equivalent to that of president. The chairmanship was commonly occupied by the leader of the SED – short exceptions were the period of transformation from the leadership of Ulbricht to Honecker from 1971 to 1976 and the immediate aftermath of the SED's collapse in 1989 – whereas the leaders of the smaller parties served as deputy chairmen. Originally, the State Council also could issue statutory decrees and legally-binding interpretations of constitution and laws. The diplomatic role of head of state solely rested with the chairman. Both the body's legislative powers and the chairman's special diplomatic status were formally abolished in 1974. Though the Council formally exercised its functions collectively, it was dominated by its chairman, especially if the chairman was also leader of the SED. In contrast, the predecessor post of president was a relatively weak position. However, the body had some importance as an advisory and decision-making body under Walter Ulbricht. When Ulbricht lost power in the early 1970s, the body was reduced to a ceremonial role. The 1974 amendments reflected this development; when Honecker became chairman in 1976, he derived most of his real power from his party post. The secretariat of the State Council was of some practical importance as its approximately 200 employees since 1961 dealt with citizens' petitions. Authorities in government and economics were obliged to cooperate with the secretariat on this. When Egon Krenz, Honecker's successor as leader of the SED, failed in his bid to preserve his party's rule in East Germany, he resigned from his offices in party and government, including in role as chairman of the State Council. To mark the end of the SED's monopoly on power, LDPD leader Manfred Gerlach was elected chairman. However, the body ceased to be of political importance and merely oversaw the transition to the parliamentary elections of March 1990. The new People's Chamber, the first that emerged from free elections, constituted on 5 April 1990. Among its first measures was an amendment to the constitution abolishing the State Council. As provided in the constitution, the president of the People's Chamber, Sabine Bergmann-Pohl, served as interim head of state until reunification with West Germany on 3 October. ^ Cook, Bernard A. (2001). Europe Since 1945: An Encyclopedia. Taylor & Francis. p. 1284. ISBN 9780815340584. This page was last edited on 22 January 2019, at 08:13 (UTC).